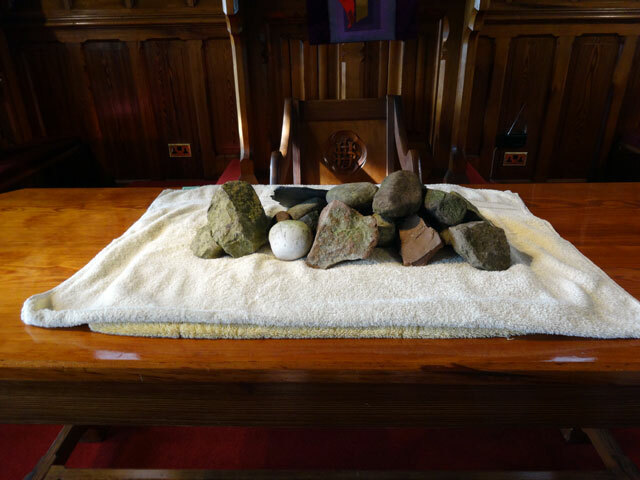 The communion table is covered with stones -- Church Stones -- with which Jeff illustrated his address on 'building on the rock'. After walking Mix and breakfasting with our visitors, I drove them and Mum to Church, Rachel having gone on ahead to get the organ into operation. The service was a lively event led by our new assistant minister, Jeff. He was good and afterwards Mum and I went to the Stated Annual Meeting while Rachel drove our guests home. In common with many congregations we have trouble balancing our income and expenditure, well there are few of us and almost all of our givings are required to pay the costs of ministry. But everyone was in good heart as Dorothy gave her first financial report as treasurer. Back home, we all enjoyed Sunday lunch before I loaded Mum, Cathy, Bill and Morag into my car and we set off on a mystery tour which took in St. Abb’s (a lovely look down on the harbour and the sea beyond), Coldingham Priory (where we explored the grounds), Eyemouth (a walk around the harbour, along the beach and back through the town), Reston (a visit to Mum’s former cottage which is currently on the market) and then home in time for afternoon tea before another snack in the farmhouse. In the evening we talked, breaking off to watch Mr. Selfridge followed by Poldark – the two being necessary viewing because we all watch Mr. Selfridge and Bill and Morag watch Poldark. So everyone went to bed happy! It had been a super day.